Balmoral Resumes Expansion Drilling… | Balmoral Resources Ltd.
(Vancouver, October 4, 2018) Balmoral Resources Ltd. (“Balmoral” or the “Company”) (TSX: BAR; OTCQX: BALMF) is pleased to announce that drilling on the Grasset and adjacent Fenelon properties, focused on the continued evaluation of the nickel-copper-cobalt-PGE potential of the Grasset Ultramafic Complex (“GUC”), commenced during the last week of September. A second drill has now been added and has commenced drilling. The Company has expanded the Grasset portion of the summer-fall drilling program which will increase the planned program to over 11,000 metres in total. The Grasset nickel-copper-cobalt-PGE deposit and host Grasset Ultramafic Complex were discovered by Balmoral in 2014. The deposit occurs at the southern end of the 10 kilometer long GUC, proximal to the regional Sunday Lake deformation zone (see Figure 1). Drilling during 2014 and 2015 outlined an initial Indicated Resource Estimate of 3.45 million tonnes grading 1.56% nickel, 0.17% copper, 0.03% cobalt, 0.34 g/t platinum and 0.84 g/t palladium (see NR16-04, Mar 7, 2016 and the Company’s website for full disclosure) from the high grade core of the deposit. This high grade core lies within a much larger nickel sulphide body totaling over 15 million tonnes. Grasset is the largest nickel sulphide deposit in the Abitibi region and one of the largest nickel sulphide deposits in North America not currently owned or controlled by a producing mining company or private equity interests. The Grasset deposit is comprised of two zones of nickel sulphide mineralization – the H1 and H3 zones (see Figure 2) - which extend for 1,100 metres along strike, both of which remain open along strike to the northwest. The H3 zone is the larger, higher-grade portion of the deposit, has been intersected to a vertical depth of approximately 550 metres, and remains open for expansion (see Figure 3). Nickel sulphide mineralization at Grasset is characterized by very high nickel tenors and, as demonstrated by initial testing, very favourable metallurgical characteristics via a standard and simple floatation process which leads to high metal recovery rates and a smelter-friendly concentrate. The balance of the host GUC remains significantly underexplored with very widely spaced drill testing in 2015 defining a series of additional nickel sulphide discoveries, and in several cases proximal gold discoveries, before drilling was suspended. A number of these discoveries are now slated for follow-up testing, and a series of exploration holes into new targets in the GUC are planned. It is anticipated that drilling will continue through the end of October and into November. Drilling has now been completed on the Martiniere and Detour East Properties. In total the Company has completed 8 holes totaling 2,027 metres at Martiniere and 6 holes totaling 1,885 metres on the Detour East Property. At Martiniere, drilling in the vicinity of the LAM gold discovery successfully intersected anomalous gold mineralization, including a high grade intercept of 0.89 metres grading 8.11 g/t gold and separate broader intercepts of 4.57 metres grading 0.51 g/t gold and 12.15 metres grading 0.25 g/t gold, in the first two holes of the program. Gold mineralization at LAM, like in the Bug gold deposit 4.0 kilometres to the southeast, occurs proximal to a north-northwest trending felsic porphyry intrusions. Two holes at Martiniere tested the Niquet geophysical anomaly and confirmed the presence of a zoned mafic/ultramafic intrusion associated with the anomaly. Disseminated sulphide mineralization occurs within the ultramafic unit, causing the anomalous chargeability response, but no anomalous nickel or PGE mineralization was reported. 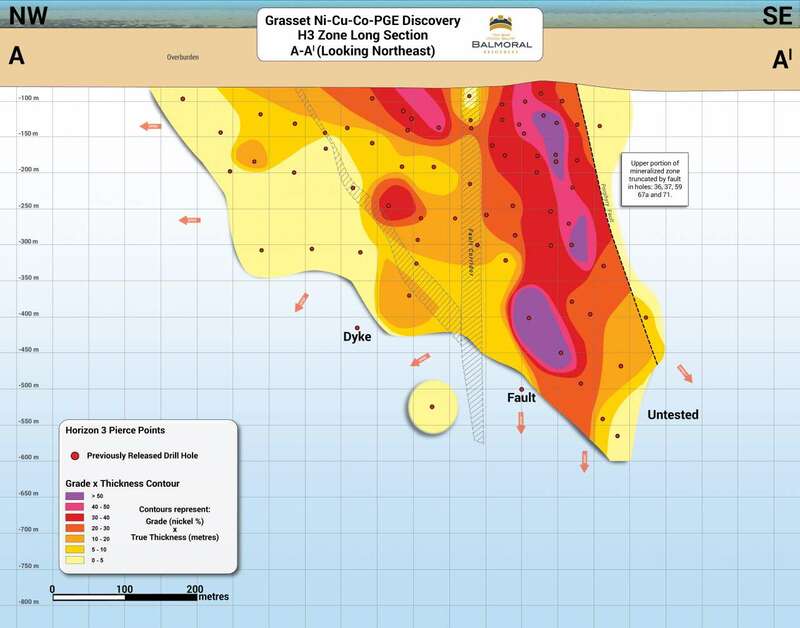 Assay results for the drilling completed at Detour East remains pending. Drilling has led to the successful identification of two new ultramafic intrusions on the property and has continued to intersect broad-scale shearing and deformation across distances in excess of 100 metres in the northeastern quadrant of the property, along the projection of Detour Lake gold mine-related Sunday Lake deformation zone. Mr. Darin Wagner (P.Geo. B.C. and Restricted Permit, Que. ), President and CEO of the Company, is the non-independent qualified person for the technical disclosure contained in this news release. Mr. Wagner has supervised the work programs on the Company’s properties since inception, visited the properties on multiple occasions, examined the drill core or high definition photos thereof from the holes summarized in this release, discussed and reviewed the results with senior on-site geological staff and reviewed the available analytical and quality control results. This press release contains forward-looking statements and forward-looking information (collectively, “forward looking statements”) within the meaning of applicable Canadian and United States securities laws. All statements, other than statements of historical fact, included herein, including statements regarding the anticipated content, commencement, duration and cost of exploration programs, anticipated exploration program results, the discovery and delineation of mineral deposits/resources/reserves, the timing of the receipt of assay results, the visual continuity of certain mineralized intervals and business and financing plans and trends, the potentially open nature of the mineralized zones/deposits on the property and the potential for future discoveries of additional mineralization on the property are forward-looking statements.Forward-looking statements are typically identified by words such as: believes, expects, anticipates, intends, estimate, postulate and similar expressions or are those which, by their nature, refer to future events. Although the Company believes that such statements are reasonable, there can be no assurance that such statements will prove to be accurate, and actual results and future events could differ materially from those anticipated in such statements. The Company cautions investors that any forward-looking statements by the Company are not guarantees of future performance, and that actual results may differ materially from those in forward-looking statements. Important factors that could cause actual events and results to differ materially from the Company’s expectations include those related to weather, equipment and staff availability; performance of third parties; timing of receipt of assay results from third party analytical facilities; risks related to the exploration stage of the Company’s projects; market fluctuations in prices for securities of exploration stage companies and in commodity prices; and uncertainties about the availability of additional financing; risks related to the Company’s ability to identify one or more economic deposits on the properties, and variations in the nature, quality and quantity of any mineral deposits that may be located on the properties; risks related to the Company’s ability to obtain any necessary permits, consents or authorizations required for its activities on the properties; and risks related to the Company’s ability to produce minerals from the properties successfully or profitably. Trading in the securities of the Company should be considered highly speculative. All of the Company’s public disclosure filings may be accessed via www.sedar.com and readers are urged to review these materials, including the latest technical reports filed with respect to the Company’s mineral properties.